Beatles Rarest Promo 45 - "Ask Me Why"/ "Anna" (Vee-Jay Special DJ No. 8, 1964). 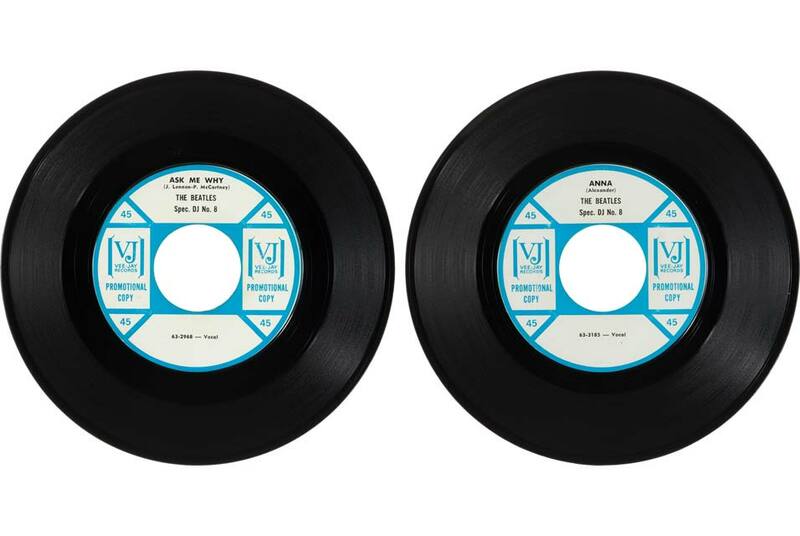 Sold for: $35,000.00 BEVERLY HILLS, CA.- The Gold Standard names of Entertainment & Music memorabilia shone brightly on July 24 at Heritage Auctions’ $878,000+ Signature® Beverly Hills event, as an Academy Special Award©®™ (realized: $98,500), the rarest Beatles promo record of them all (realized: $35,000) and a Marilyn Monroe-signed headshot (realized: $32,500) – inscribed to LAPD office Roy Garrett, who let the star off with a warning in exchange for the pic – topped the considerable offerings in Beverly Hills. All prices include Buyer’s Premium. “The bidding was spirited and steady all day long,” said Margaret Barrett, Director of Entertainment & Music Auctions at Heritage, “with major names dominating collector attention and bids.” The Academy Special Award©®™ was presented to Thomas Armat in 1947 for his pioneering work on inventing the first patented American film projector continued the string of impressive prices for pre-1950 Academy Awards©®™, while the rarest Beatles Promo 45 of them all, “Ask Me Why”/ “Anna” (Vee-Jay Special DJ No. 8, 1964), in realizing $35,000, demonstrated the continuing viability of The Beatles as the greatest – and most collectible – rock band of the all. The true star of the show, however, was the greatest Hollywood starlet of all time, Marilyn Monroe, as a host of Monroe-related memorabilia was featured in the auction, garnering significant national and international press, and realizing impressive prices for the top pieces. No item got more attention or bids than a Marilyn Monroe signed black and white photograph, circa 1956, which realized an astounding $32,500 against a pre-auction estimate of $8,000+. The headshot came to auction from The Roy Garrett Collection, A Beverly Hills police officer who joined the force in 1946. Garrett would frequently stop movie stars and would occasionally ask them to send him an autographed photo. “Most of them did,” said Barrett. “He evidently let Marilyn go without a ticket as he received this from her in the mail a few days later. It’s the star in one of her legendary glamour poses and, written in blue fountain pen it reads: ‘To Roy,/Love & Kisses and/thanks for keeping me/out of the clink!/ Marilyn Monroe.’” Two more Monroe-associated items figured prominently in the top portion of the auction, with her likely Final Signed Check, dated Aug. 4, 1962, attracting significant media attention and surpassing its’ pre-auction estimate to finish the day at $15,000 – the check was to Pilgrim’s Furniture and was for $228.80 – while Monroe’s hot pink Pucci Blouse, circa 1962, inspired many collectors to bid to the final tune of $12,500. Further highlights include, but are not limited to: Johnny Cash Personally-Owned and Stage-Played Guitar Made by Danny Ferrington: A majestic black acoustic guitar played and loved by the Man in Black himself. Realized: $30,000. A Gloria Swanson Academy of Motion Picture Arts and Sciences 'Certificate of Nomination for Award' for “Sunset Boulevard,” Paramount, 1950: Presented to the star, text reads in part “Be it known that/Gloria Swanson/was nominated for an Academy Award of Merit/for Outstanding Achievement/Best Actress/Sunset Boulevard.” Realized: $18,750. George Harrison original drawing (2000): George Harrison drew this for his friend Danny Ferrington, called the “Calvin Klein of guitars.” George created this drawing of Danny's workshop while the two were in Hawaii together, and signed it “Keoki,” Hawaiian for “George.” Realized: $15,000. Carlos Santana Personally-Owned and Signed 1991 Tom Anderson Guitarworks Classic Model Guitar: A gorgeous black finish, double cutaway guitar, Serial Number 07-08-91P, signed in silver paint pen on the lower bass bout by Carlos Santana. Realized: $15,000. Pearl Jam 1993 Favorite New Artist, Pop/ Rock American Music Award to Dave Abbruzzese: This band has always been a bit hard to categorize as illustrated by the American Music Awards in 1993. They won as Favorite New Artist in both Pop/ Rock AND Metal/ Hard Rock. Offered here is the actual pyramid-shaped crystal award statue, 4.5" x 14.25" x 4.5", given to drummer Dave Abbruzzese, from his personal collection. Realized: $11,875.